Yeah, yeah…I’ve been slacking on the blog again lately…but, hopefully, this will make up for it. Let’s go back to the 80’s…and some great moments in the Portland Winterhawks vs. Kamloops Blazers history. 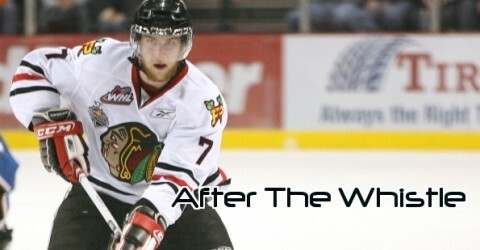 Game 1 of the Winterhawks and Blazers goes Friday night at the Veterans Memorial Coliseum…tickets available at www.winterhawks.com. Dennis Holland was the face off goal master back in those days. Andy, can you find the big brawl they had back in the 80’s? Thanks for posting those!!! AWESOME! Hey Andy …just one word – THANKS!! Can you find the original Latos-Poeschek fight? It was also a classic. Thanks for setting the pace for a great series. Those Cooperalls sure take me back to when I played as a kid. Hillarious! Thanks for posting that video, Big Lebowski. I was at that game and remember it well. Thanks for posting that video, Big Lebowski. I was at that game and remember it well. Thank you too, Andy, for posting the other videos. The crowd looks incredible! I was there for the big brawl during the 80’s. I believe it was against Prince Albert, a bench clearing brawl. They actually brought in the Portland police to break it up. I was there for the great series against Kamloops also, brings back memories. the blogger has left the building.